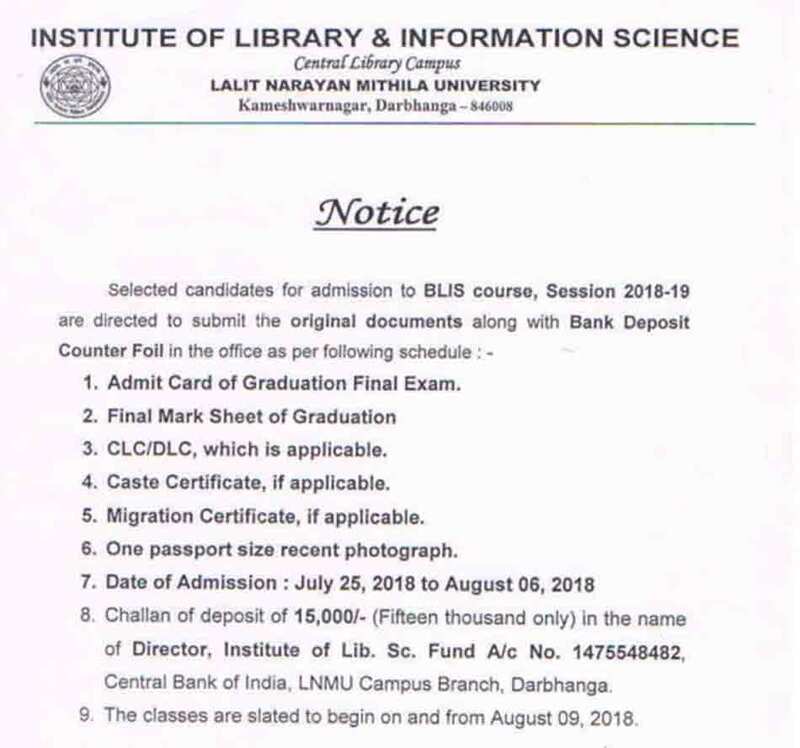 LNMU has been announced the Lalit Narayan Mithila University BLIS Result for the aspirants who have given the Entrance examination & applied for the admission in Bachelor in the bachelor of library science (or “bachelor of library and information science”). Aspirants who have applied for the admission can check the BLIS admission selected list for the download. BLIS LNMU Selected List. Aspirants from the below link and from the official website they can check their name in the LNMU BLIS Selected list. Every applied student means aspirants can download the list of BLIS Selected list in pdf and check their name and details for they confirm their name for admission. The applicants whose name figure in waiting list will get their admission in the event of the vacant on first come and first serve basis. they can give their admission from August 07 to August 10, 2018. They will be required to bring all the papers with challan of deposit of 15,000/- as noted above. The selected candidate for admission in the course of BLIS, Session 2018-19 are directed to submit the original document along with Bank Deposit. Counter Foil in the office as per following schedule. Admit Card of Graduation Final Exam. Date of Admission: July 25, 2018, to August 06. 2018.